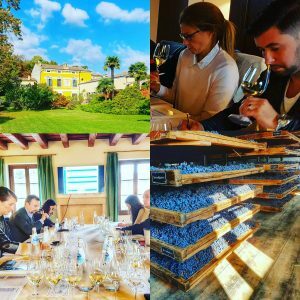 Wine Academy Italia WSET Courses in Italy during 2017. We have just finished running our October WSET Level 2 at Serego Alighieri #Masi in Valpolicella. A great group of students and such a wonderful venue. We are busy for the remainder of 2016 (in November we have Level 3 courses in Campania, Sicily and Valpolicella), attention is now turning towards courses in 2017. 2017 dates for Verona, Rome and Sicily are being published, with other venues following shortly. Wine Academy Italia course prices include IVA, lunch each day (exc. Rome), WSET materials, tastings, exam fee and cellar tours at our winery venues. During 2017 we will be expanding our range of Wine Academy Italia Exclusive courses, with a new four day WSET Level 2 ‘Summer in Sicily’ course in July and ‘Vendemmia Intensive’ courses now being available for WSET Level 2 (Valpolicella) and Level 3 (Umbria) students. We will be developing more of these specialist courses in the future. 2016 has been a record year for Wine Academy Italia and we look forward to working with our existing WSET students and new ones as they build their experience in the international world of wine.